I am a member of the Three Affiliated Tribes, a Native American tribe that resides in northwestern North Dakota on the Ft. Berthold Indian Reservation. I am originally from Dickinson, N.D., a little more than 100 miles from the Standing Rock Sioux Reservation and the site of the protests. Of course, when this protest started, I had to take a side, as it was pertaining to my home state. However, not many people know how difficult that decision was. I did mention earlier that I came from the Three Affiliated Tribes, so many people assume that I immediately took the side of the Standing Rock Sioux, however, that was certainly not the case. I am currently enrolled as a student at Montana State University, pursuing a degree in paleontology and Native American Studies. As an out-of-state student, financial aid and scholarships were vital to paying off the fees college throws at every student, and for an out-of-state student, it is much more expensive to go to Montana State. However, I have managed to pay off all of my fees and I will more than likely graduate college with little to no debt. However, some of my scholarship money comes from the Three Affiliated Tribes, a tribe that gets a lot of its income from the Bakken Formation, which most of the reservation is situated on. Due to this, “oil money” is helping pay for some of my education and that’s where my difficult decision came in. As a Native American, I wanted to declare solidarity with the Standing Rock Sioux, however, as a member of the Three Affiliated Tribes, I had to be careful in how I chose a side, since it would be hypocritical of me to choose without providing my stance with effective arguments. 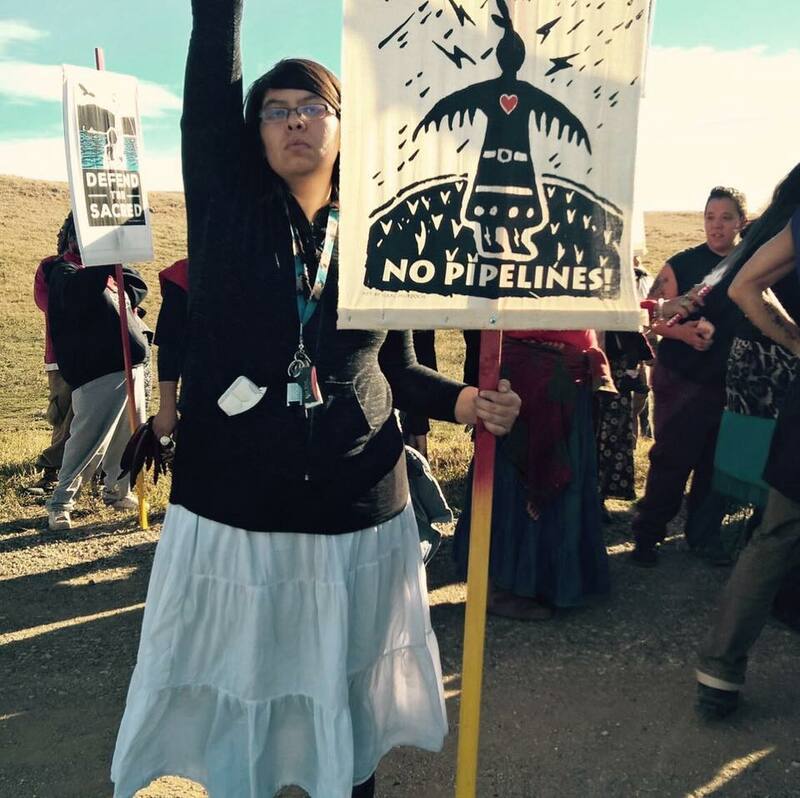 When I started my research on the Dakota Access Pipeline and how it ended up to the conflicts that are occurring now, the first place I looked was the website of Energy Transfer Partners, the company behind the Dakota Access Pipeline. Where you had your typical information about how long the pipeline would be, its starting and ending destinations, etc., I was more concerned as to how they had managed to get their permits. In this case, I was looking for tribal consultation papers from both the Standing Rock Sioux Tribe and the Three Affiliated Tribes. The date that I started my research was shortly after my first trip to Standing Rock, which was over Labor Day Weekend. I had still not chosen a side fully because I didn’t know if this was just the tribe fighting against a pipeline due to lack of consultation and regard for treaty rights, or if it was due to environmental organizations that follow pipeline construction. I was with two other people at the time (I was the one driving) and we were keeping in check with the news that was coming from the protest sites. It was during this time that my mother decided to call me and what she said would ultimately determine which side of the issue I would take in this fight against the “black snake.” My mother was frantic while she was talking to me and I was confused as to what was happening. I didn’t know who “they” were, but it doesn’t take a rocket scientist to figure out exactly what my mother was saying. People were being attacked with dogs and pepper spray. I could only assume that my mother was talking about law enforcement or some other entity associated with Energy Transfer Partners. My suspicions would be confirmed later that night when I went up to the frontline camp to locate other members of the group I was supposed to accompany earlier that day. When I first arrived at the camp, I could not believe the overwhelming feeling the entire camp gave off. I am an atheist, however, I could feel a greater power there. It was peaceful, it was calm, it was moving, and it was nothing like what the local media outlets in my state were reporting. I have said this to many people who claim that the protesters “happened to be friendly while at my time there” (I have been there five times already): I highly doubt that the protesters would “stop being violent” if they heard an MSU student was coming to the camps. My meaning behind this was that the protesters were never violent to begin with. They are what they claim to be: protectors of the water. They are not there to hurt other people, they are there to protect something that the human body needs. This trip to Standing Rock and the sights of the camps were enough to push me toward my decision of standing with the Standing Rock Sioux Tribe. My research led me from traveling to the camps to finding important documents and key arguments that both sides had. But, it would be more accurate to say that I didn’t find what I was looking for. I never found the tribal consultation papers that Energy Transfer Partners claim they had. Usually, tribal consultation papers are found within the public service commission of a state that the project affects. For North Dakota, their website should have consultation papers from both the Three Affiliated and Standing Rock Sioux Tribes, however, there is no document suggesting consultation. It is also interesting to note that South Dakota and Iowa have proof of tribal consultation (Illinois does not need those documents because the pipeline is not near a reservation). In my research, I have also found that there were many petitions of concern from landowners that were directly affected by the pipeline. This is from North Dakota alone, a state that depends heavily on oil production. There were also agendas from previous meetings that were held and so far, nothing has turned up that regards any tribe. My search also took me to the archaeological aspect of the pipeline controversy, and it is a more familiar field to me. Study units of the Cannonball River have been conducted and it has wielded many archaeological sites that have been found in the area. One key point that came up were four sites of interest that were documented (the Standing Rock Sioux Tribe claim that there are thousands of sacred sites within the area, but I will only use the documented sites that I have found from reading these units). These documents did not tell me where these sites were located, however, it was interestingly close to the Standing Rock Sioux Reservation, near Highway 1806. A newspaper article later came up that confirmed my suspicions: these four sacred sites were the same ones that had been destroyed over the Labor Day Weekend. The more evidence I found, the more I found myself supporting the Standing Rock Sioux Tribe. Finally, this pipeline violates the Ft. Laramie Treaty of 1868 and 1851, Article 2 from both documents, which clearly state that the Standing Rock Sioux Tribe shall enjoy the “absolute undisturbed use and occupation of their permanent homeland.” With the completion of this pipeline, anything downriver of the pipeline will be affected, especially if a leak is eminent. I have been told by a representative of the petroleum industry that pipeline leaks are due to the pipeline itself being old. I have concluded from that statement that this pipeline will definitely leak, if not now, then in the future. It is something that can be easily avoided. Information I could find on the pipeline that may have been beneficial to me and that could help the pipeline’s case was that it would have an economic gain on the state, as it would increase oil prices. However, I later found out that pipelines did not have as big of an impact on the state’s economy as many thought. Less jobs develop from a pipeline after it is completed than when it is still being constructed. Jobs that are available from a pipeline are only available to people with Master’s and Doctoral degrees, and for the Dakota Access Pipeline, only 40 jobs will be available. Overall, this pipeline drains money from the state and with the recent protests, this pipeline won’t be able to pay off the debt North Dakota has found itself in. In conclusion to this rather long excerpt, I stand with the Standing Rock Sioux Tribe in this controversial fight over civil and treaty rights. Police brutality and violent confrontations could have been avoided if Energy Transfer Partners had respected the tribe’s position on the pipeline. 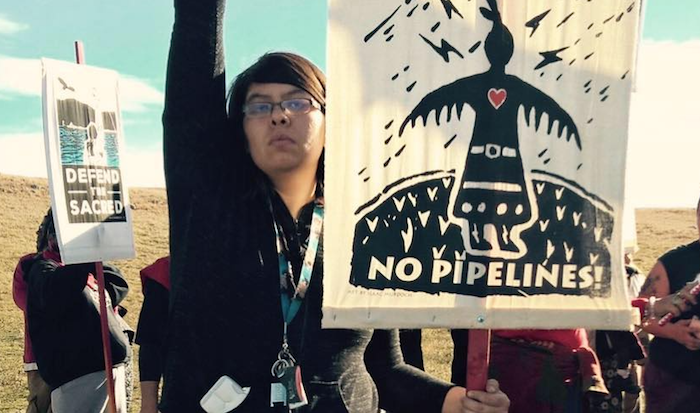 This pipeline did not need to be put through that specific spot near the border of the reservation, yet they did that anyway. An alternate route for the pipeline would have been north of Bismarck, North Dakota however, the main reason as to why this route was changed was because the people of Bismarck have stated complaints that it was a danger to their water supply. This is the exact same reason as to why there are protesters that are defending the land against this pipeline. This pipeline can possibly harm their water supply. Much of this information came from “pro-DAPL” sources and the North Dakota government websites. But, you can interpret this information in any way you see fit. However, you cannot ignore facts.